i was going thru my stash last night when i saw my Cherry Culture loot. then i realized that i haven't been able to use my nyx makeup yet, except for the one trio that i've tried weeks ago. honestly, i already forgot all about them. i know..i know..i must not waste precious makeup, so what's the best way to try them on? what else but to use them for my EOTN. yeah...the colors are really dark and pigmented, and they look they have the same shades, but they are not. the trio has a dark purple, a dark blue and a dark gray. use a light hand when dipping your brush so you won't pack too much color, but instead, start with a light application then build it up if you want. i love this trio because i'm a sucker for dark eye makeup. 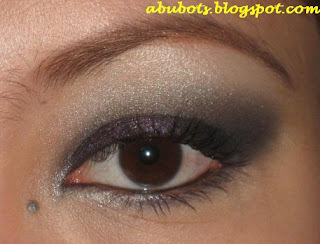 it's great for smokey eyes, you can use each color to have a 1-color smokey look or use all three. 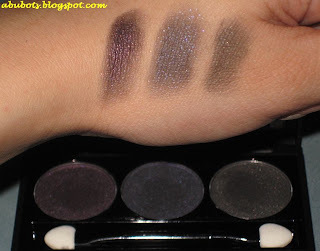 i am really loving NYX eyeshadows! Sis, I honestly want to let you know that any dark colored e/s looks WONDERFUL ON YOU! your eyes POPPED out and you looked so beautiful!!! I love it!!! this looks so great on you!! What brush did you use for blending galing ng blending eh! anyway, ok ba sis ang artdeco gloss? Love it! Love it! Love it!!!!!! You look so pretty in dark e/s... can't agree more with sis Nikki! I love it. It's looks great on you as well. Why don't you do makeup videos? i love it! that is soo pretty!! hi sis yda84, thanks din po. i used MAC 222 for blending. i really love that brush, it works wonders! yep sis shiana the artdeco lipgloss is really nice. not sticky and the shade is nice to go with dark eye makeup! kaya lab na lab kita ate gracie! heeheh ikaw naman idol ko sa neutrals! i really appreciate this ladies, i think i am getting my makeup mojo back. now that my beloved X is far away, i need to get busy with something that would make me happy as well..and that is MAKEUP! sis which brush is better for blending, the 222 or the 224? meron ka both diba? coz i might sell my 224, haha, sobrang bilib sayo eh..
sis jheng,i think this is my fave fotd of yours.. smoky eyes looks good on you..